I tried to use my Scanner to open up the referring application because I wanted to automate further actions from there. It seems that even KM recognises the name of my device because it fills the name field automatically after the device is active. But it doesn't do anything afterwards. Any hints or suggestions are highly appreciated. Thanks! 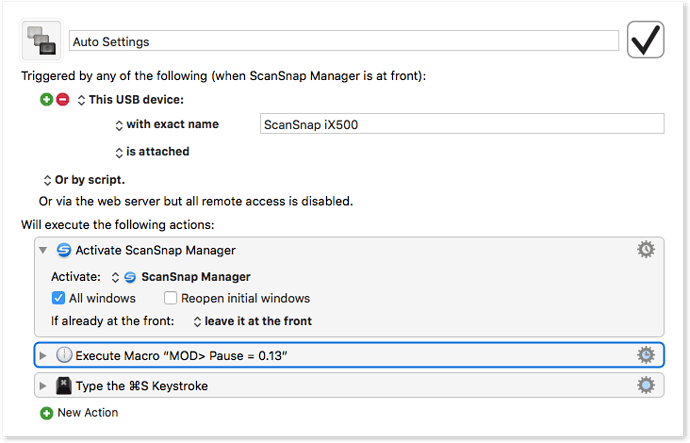 The macro is in a macro group that is only activate in ScanSnap Manager. 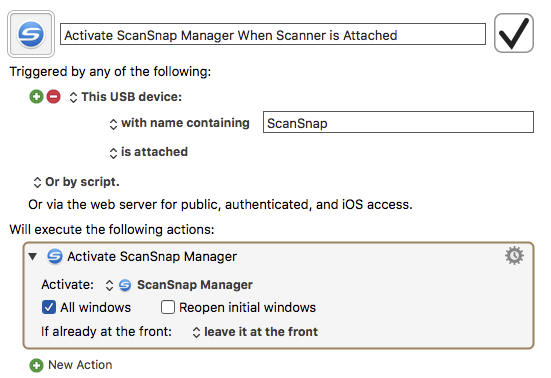 So it cannot be triggered by the scanner until after you activate ScanSnap Manager. Move it to a macro group that is always active (personally I have a macro group called Application Activations for macros like this). Thanks so much Peter, sometimes one is blind for the most simple things. I also have already a folder Global Applications Starts and from there (of course) it works. when it is in a global Macro Group. Yes, this is pretty much a “must have” macro for anyone with a ScanSnap scanner. I thought I had posted it to the Macro Library, but I can't find it. Maybe it is just noted as an example macro somewhere in the docs or wiki.